A hero often has larger-than-life qualities and is the one for whom all the women set their cap. But some are unassuming and overlooked. Meet nine men from bygone days who can have their pick of the ladies when their true worth is revealed, but choosing right isn't always easy. 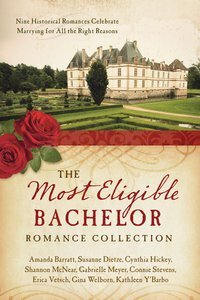 About "The Most Eligible Bachelor Romance Collection (9781634090315 Series)"
Amanda Barratt has won several awards for her work and enjoys writing about eras such as Regency and Victorian England, and the Gilded Age. A member of American Christian Fiction Writers, she lives in northern Michigan with her family, where she reads way too many old books, watches period dramas to come up with new plotlines, and dreams of taking a trip to England. Amanda loves hearing from her readers on Facebook and through her website amandabarratt.net. Susanne Dietze began writing love stories in high school, casting her friends in the starring roles. Today, she writes in the hope that her historical romances will encourage and entertain others. A pastor's wife and mom of two, she loves fancy-schmancy tea parties, travel, and curling up on the couch with a costume drama and a plate of nachos. You can visit her on her website, www.susannedietze.com . Cynthia Hickey grew up in a family of story tellers and moved around the country a lot as an army brat. Her desire is to write real, but flawed characters in a wholesome way that her seven children and five grandchildren can all be proud of. She and her husband live in Arizona where Cynthia works as a monitor in an elementary school. Transplanted to North Dakota after more than two decades in Charleston, South Carolina, Shannon McNear loves losing herself in local history. She's a military wife, mom of eight, mother-in-law of three, grammie of two, and a member of ACFW and RWA. Her first novella, Defending Truth in A Pioneer Christmas Collection, was a 2014 RITA® finalist. When she's not sewing, researching, or leaking story from her fingertips, she enjoys being outdoors, basking in the beauty of the northern prairies.nbsp;Connect with her atnbsp; www.shannonmcnear.com , or on Facebook and Goodreads.